Race day registration for the 10 mile distance was $35 and I got this cute t-shirt and a raffle ticket. Since it was a relatively small event, I wasn’t sure what to expect in terms of course support, so I carried my own water and fuel. Unfortunately the Garmin bad luck fairy paid me a visit this morning and I couldn’t get it to turn on. I was upset because I wanted to track my pace over the 10 miles, but there wasn’t anything I could do. At least the weather was about perfect for a race – sunny and about 60°. I was glad I made the decision to go with short sleeves. I took a GU Roctane right before the start. The first few miles of the race were sort of loops that wound around the park. Pretty much everyone else doing the 10 miler was a runner so I was definitely at the back of the pack, but there were a few people in front of me who I tried to keep in sight as long as possible. Then the course turned into an out and back and I was able to do some people watching. It was interesting to see the race leaders come by because they made running look so effortless compared to the expressions of the more mid pack runners. I was still feeling good at mile 3, so I decided not to fuel up yet. When I hit mile 4, I knew it was time for my next GU and that ended up being a good choice because there was a water station just after that so I could throw away my empty GU packet. The turnaround was just after mile 5. I hope this doesn’t sound too vain, but I was happy to get to the turnaround because I wanted to see how many people were behind me. I counted about 10. Somewhere between miles 6 and 7, it started to get hard because I couldn’t see anyone in front of me anymore. On one hand it was good that no one was passing me. But on the other hand it felt like I was basically out there walking on my own and it was hard to stay motivated. But I just kept putting one foot in front of the other and telling myself to keep going because I really just wanted to be done. It didn’t help that it started to get windy and I was walking into the wind for a bunch of the last few miles. I had 4 GU Chomps at mile 7 which kept me occupied for a bit. Then the course started winding around again. Now that there weren’t a lot of people out on the course it was a little difficult to tell where to go. I came across a couple women who were debating whether they had taken the right path or not. I slowed down a little, but then just keep going. The race organizers had done a pretty good job marking the course with chalk and I decided to trust that they would have indicated if we were supposed to turn. After I passed the two women, I thought they’d catch up to me again but they never did. Finally I got to mile 9 and the finish area was in sight. With about half a mile to go, I could hear the announcer starting the awards ceremony. That encouraged me to keep pushing through to the finish because I didn’t want to miss the raffle. It was a little weird coming in to the finish line because I had to walk through part of the crowd gathered around for the awards. But the people around were really nice and cheered as I approached and finished. Woo-hoo! Based on those results, I’m thinking about revising my goal for RnR AZ. Instead of just beating my time from Vegas, I might shoot for finishing under 3 hours. I already ran it through a pace calculator and at a pace of 13:38 for a half marathon, my time would be 2:58:35. Anyway, to wrap up the report I followed the advice from the Get Fit seminar and had a banana right away after finishing. There were also oranges and chocolate chip cookies available. Then it was raffle time. There were some really nice prizes like Starbucks gift cards, movie tickets, and digital photo key chains. Sadly, I didn’t win anything from the raffle, but it was still a good event and I’m happy I went. This race sounds like a great confidence boost for you! That \’s great that you got to revise your goal time! 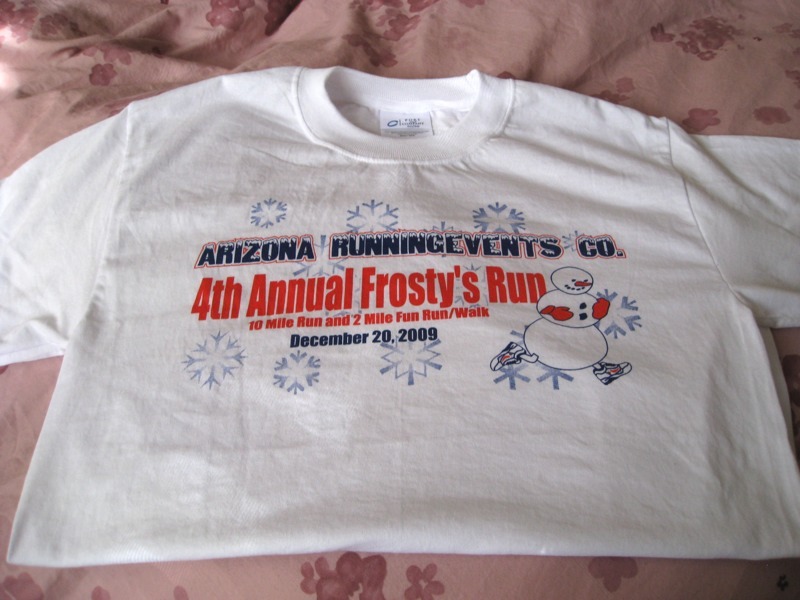 And 60ºF for a “Frosty” run. Hahaha. Great job being so fast on 10 miles! I think you can totally beat your Vegas time!